You come out in the morning, and your pretty little car is a mess. Whether you find key-scratches across the sides, the windshield shattered or the tires slashed, it all fits nicely under the legal-umbrella of vandalism. Your insurance may cover it and for that you'll need to file a police report. But that is probably the only action the police will take on the matter. Vandalism of an automobile usually occurs under cover of night without witnesses. The only action you can expect from the police is to log a police report so you can file a claim with your insurance company. The term "vandalism" describes a broad-category crime that encompasses many different types of behavior. Vandalism means intentional behavior destroying or defacing property belonging to another. 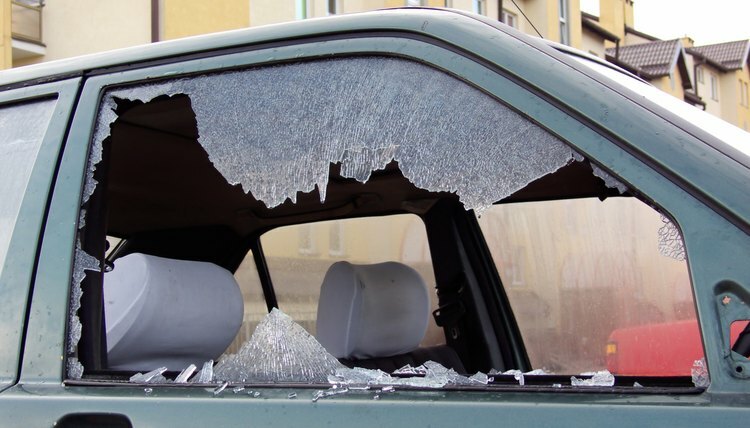 If you are talking about a vandalized car, acts of vandalism can include keying, egging, writing graffiti on it, spray painting parts of it, slashing tires and cracking or smashing windows. Vandalism is a crime under state laws, although it may be termed "criminal damage," "malicious trespass," "malicious mischief" or some other legal term. While the laws represent an effort to deter vandalism, they obviously work only if vandals are prosecuted under the laws. In order for vandalism to result in a criminal charge, the police need to have enough information to arrest someone, and this doesn't happen very often. Imagine the scene. You head out to your car to drive to work and find that it was keyed on both sides. You phone the police non-emergency line and report that someone vandalized your car. You parked it the prior evening, so the vandal did it sometime during the night, but you have no idea who did it. If you expect the police to come out and dust the car for fingerprints, you have an unrealistic view of the police. Police departments are overloaded with investigating and trying to prevent crimes against people. In most big cities and even small towns, police cannot and will not do much to figure out who keyed your car. If you happen to come out while it is being done and you tackle the guy doing it, they may charge him with vandalism. Otherwise, they take down the report, provide you a copy for your insurance claim and send you on your way. In some big cities, like San Francisco, you file a police report for a vandalized car online, then print off a copy for your insurer. You need to file in person at the police department only if you know who did it. That's because the police are not very likely to get involved in a vandalism investigation without solid evidence of who was responsible. If you know for certain who keyed your car or slashed your tires, the police may charge the suspect. For example, if you happen out just when someone is slitting your tires and you tackle the person, or you recognize your next door neighbor, the police will take your police report in person. If you want to press charges, they may send the case to the district attorney's office for charges. The type of crime charged, felony or misdemeanor, depends on the state you live in and the amount of property damage. The person may be ordered to pay fines, sent to prison or both. The person can also be ordered to pay for the damage. Theh Law Dictionary: How Long Do You Have To File A Police Report? Spengler, Teo. "What Do Police Do When a Car Is Vandalized?" , https://legalbeagle.com/5822468-do-police-do-car-vandalized.html. 10 December 2018.